In order to solidify his spot on the training squad Fatty has to go above and beyond his already *stellar* resume and raise some serious cash. But that’s where you come in, in an effort to help raise the $25k for Livestrong and World Bicycle Relief, the Fat Cyclist is offering a draw for a brand new bike under each charity. Under the Livestrong banner is a 2010 Madone 6.2, customized with your favorite colors and signed by all the riders of team Radio Shack. Under the World Bicycle Relief banner is a 2010 Gary Fisher SuperFly mountain bike. In an effort to further mix things up Mr. Bruyneel upped the ante today and said if $50k was raised for each charity, one of the contributors would win a 2010 Paris Finishing Package to witness the finale of the Tour de France. All updates can be seen here. You can support Livestrong here, and World Bicycle Relief here. 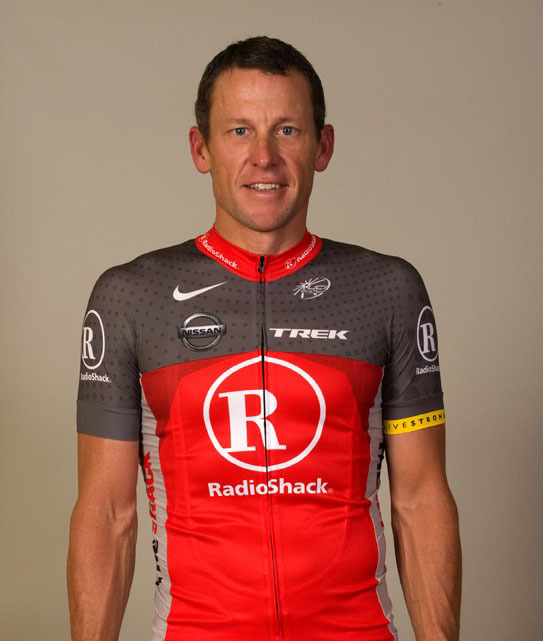 As an aside… What are your thoughts on the Radio Shack jersey? I think it’s a good start, but was expecting something a bit more dramatic from the star-spangled team. These past few days i like many others have been amazed by the brilliance of @fatcyclist. Never seen a challenge so easily overachieved as this, shame that they did not go further whilst the kettle was on the boil. Wish i could get the same support to help “disabled/physically challenged athletes! Include me into your mailing list and see if you are able to turn my 13th tdf into a success.